Nobody ever said landscaping was easy. Well, no one with any sense, anyhow. There are all kinds of dumb landscaping mistakes that even green thumbs can make. We're here to tell you what ten of the most common errors are so that you can avoid them. 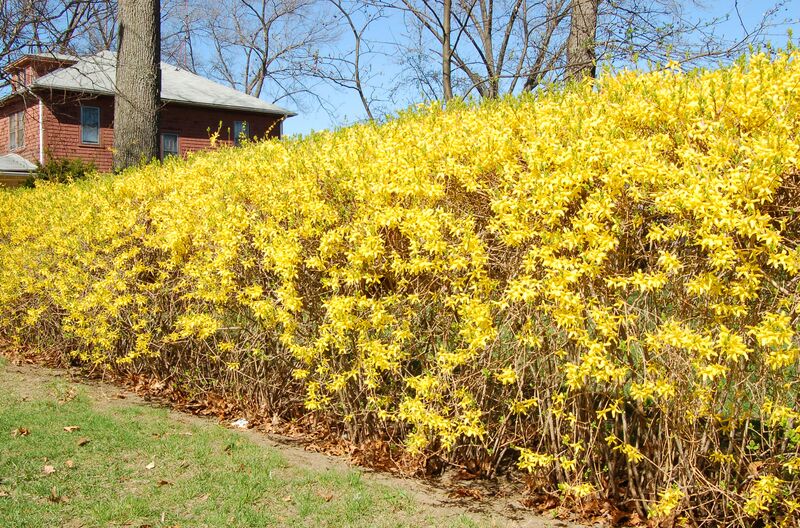 Imagine you had a row of forsythia bushes in your landscaping. Wouldn't you hate to miss out―even for a single spring―on the splendor they provide in April? Well, you easily could. Beginners often make a mistake with their shrubs: they prune them at the wrong time. Failing to prune a shrub such as forsythia or flowering quince at the correct time could remove the very buds that produce those fabulous blooms. Done properly, growing a hedge can be a great way to set your property off from your neighbor's or even to partition off one portion of your landscaping from another. That being said, neglecting hedge trimming is never a good idea as you need to keep after a hedge so that it doesn't grow out of control. The individual bushes that comprise a hedge may get out of whack if left to their own devices for too long. The solution is to trim or "shear" the hedge. Make the job of shearing easier, if you wish, by using a power hedger. It's recommended that you use a cordless hedge trimmer because you don't have to drag a cord around. While trimming your hedge shrubs, also inspect between them to check for weeds. For a hedge to look its best and grow optimally, it must be kept weed-free. Even more critically, be sure not to let any baby trees become established in your hedgerow. For example, maple samaras may blow into your hedge, fall through to the ground, germinate, and take root. Before you know it, you have maple trees pushing up through your hedge, marring its appearance. Once they gain a toehold, they can be hard to remove; you may even end up damaging your shrubs' roots in the process of pulling out the unwanted trees. The term, "girdling your trees" is applied to tree care in two different ways. An example of one of those ways is where you see that an Oriental bittersweet has wrapped itself so tightly around a tree that it has become embedded in the trunk. This invasive vine can cause trees a lot of harm, strangling their trunks and casting excessive shade in their canopies; be sure to check for its presence when you walk your property so that you can kill Oriental bittersweet before it becomes established. Humans, too, can cause this kind of girdling. A common mistake is leaving the label on a Crimson Queen maple for too long. The label's string will eventually dig deeply into the branch it has been tied to, choking off the flow of nutrients. Symmetrically arranged elements can bring a sense of elegance to your landscaping. It's an approach commonly used in foundation plantings, but when those elements are living plants, employing symmetry can mean extra work for you in the form of maintenance. Shrubs and trees arranged symmetrically will have to be kept pruned so that the pairs remain matched. It's not uncommon to find examples of shrubs growing on either side of a house entrance where the homeowner's intention was obviously to achieve symmetry. Unfortunately, one shrub in the pair was allowed to get bigger than the other, thus foiling the homeowner's plan. There's a place for ornaments in your landscaping, but avoid overwhelming your yard with too many tchotchkes. A tipping point is eventually reached, after which point these decorations detract from, rather enhancing your landscape. A smarter way to employ ornamentation is to use it sparingly, which will succeed in attracting attention to it. Conversely, the impact is minimized through dilution when a myriad of decorations sprawls across a property. Worse yet, if they are low-quality, they stigmatize your yard with labels such as "cheap," "cluttered" and "tacky." Such a landscape is far inferior, from a design perspective to one in which plant material is used exclusively, sans tchotchkes. Instead, search for a unique piece and establish it as a focal point. Speaking of the use of decorations, one of the first decisions you'll have to make in choosing between this or that ornament is whether you intend to landscape for yourself or for other people. If your answer is "for myself," that effectively ends the discussion, since what constitutes a good ornament is ultimately subjective. But if you're landscaping for real estate value or to impress the neighbors or your in-laws, you'll have to take into account how others may feel about your choice of decorations. Take tire planters, for example; some of you may love these, as they certainly say "country"―which is not at all a bad thing―but they do not say "upscale country." If you live in suburbia and care about the impression you're creating, carve out a spot in the backyard for your tire planter. It doesn't belong in your front-yard design, whether it be at the entrance of your driveway landscaping or as part of your mailbox planting. Moreover, if you're trying to sell your home, we don't recommend using tire planters in the front yard, or back. How tall or short you cut your lawn may, at first glance, seem rather arbitrary. The beginner may labor under the misconception that, as long as you mow so that your yard "looks neat," you've done the job right. If only it was that simple. Experts will quickly and vehemently set you straight in this matter, pointing out that lawn mowing is not just about keeping up appearances: it's about grass health, too. Scalping your grass, because of this, is a big no-no. They'll throw numbers at you specifying, with exactitude, just how high you should cut your grass. When you hear "hedge," you probably think of a long row of clipped hedges running along a property border, yet that describes only one type of hedge. A shorter hedge can also be planted so as to hide an eyesore. For example, an arborvitae hedge can hide a utility box from public view, while still leaving access to the box via a "hole." Eyesores such as utility boxes, raised septic systems, and even trash barrels can uglify a yard unnecessarily. Not hiding eyesores is a faux pas, unless you have absolutely no choice. Homeowners are sometimes impetuous. Excited with a new property purchase, they'll run out and hire a contractor to have a fence thrown up. Only later―after they've had a chance to live with their choice for a while―do they come to the realization that they've chosen a fence style that doesn't "work" for them. If, while you're mulling over your choices, you need to erect some kind of fencing along your border, consider a solution in which your fence is broken up by sections of shrubs. Here, the homeowners have installed inexpensive fence panels, breaking them up with plantings of colorful shrubs. At a later date, they could remove the temporary panels and shrubs and erect a more permanent fence. A dumb landscaping mistake commonly made is to select a plant without first researching its mature size. The ill-fated choice may soon outgrow its space and cause you headaches. If installed near your home, it may block a window. If planted in or near a flower border, it may cast unwanted shade on other plants. Live with the bad situation. Transplant it to another location. You would have been better off to have done your homework in the first place and selected a plant whose mature dimensions matched the located allotted to it. It may help to sort through an A-Z database of plants by scientific name to find the plant right for you.